Three circles secondary thermostatic(1x) - electronic(2x) heating system - Celsius a takarékos energia - fűtés rendszerek akár 5 év garanciával. to its centre distance of only 90 mm. PN 10, max temperature 110°C (unit without pump). 3/4” Male with swivel tang to the heat source or to the distributor. 3/4” Female to the user. Thermostatic mixing valve with temperature setting range, models F1 and F2. The heating system controller is equipped with three separate mixing valve and pump controllers, which can be launched by room thermostat signal and tuned by outer temperature signal. Able to receive three separate thermostat signals which are voltage free. the mixing valves can be controlled to heat and cool by a weekly program. 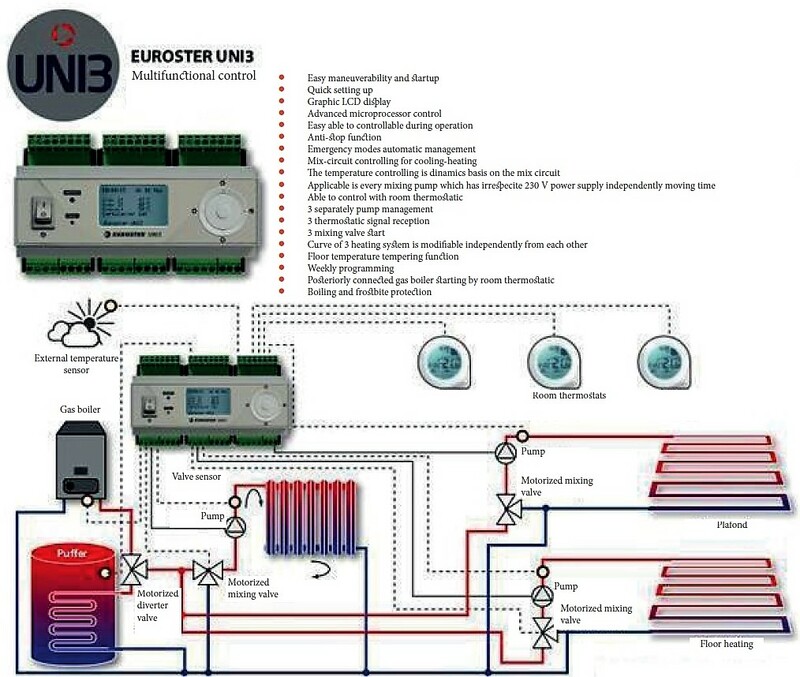 The Euroster UN13 cooling/heating controller provides two further functions, turn on the domestic hot water pump with a selectable operational mode (primary/secondary). This is programmable on a weekly basis. Furthermore, the controller can launch a circulating pump based on temperature or time mode. Both of these even by weekly programming. 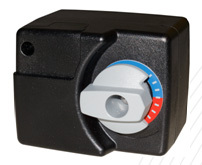 The heating system controller is able to launch other boilers (ex. : gas boiler). Thanks to its grapichal display the Euroster UNI3 cooling-heating controller gives precise and wide ranged information about its continous operation, making it lot easier to set and to check the device. The unit also includes anti-freeze function which prevents malfunctions outcoming of the freezing. Furthermore the controller is useable for buffer tank and boilers, since it has an overheating protection. During overheating it overrides the signal from the room thermostat. 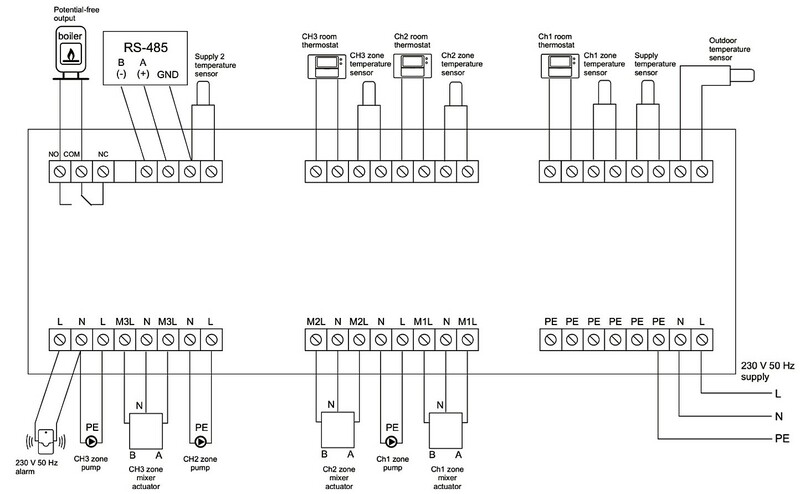 The controller has wide range of compatibity. It can be easily installed to a new or an existing system. It's basic accessory contains sensors and signallers. 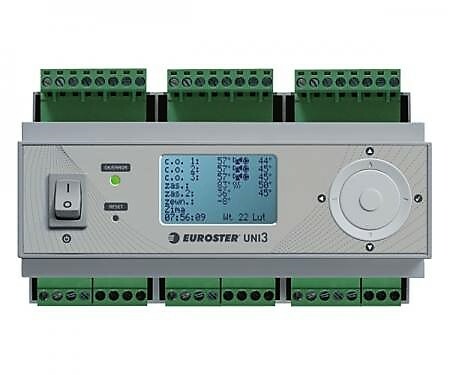 Due to its graphical display the Euroster UNI3 controller makes the setup an easy process, which can be started with the revolving command button to the right. The controller is able to manage three pieces of three or four-way mixing valve. It can be applied to all sorts of mixing valve motors (230 V). The controller manages the mixing valve not time based but thermodinamically. As a result the controller follows the values and opening dinamics we have set before. Advantage: always surveys the temperature not valve position. The installing and the setup should be done by a professional with the appropriate electrical knowledge. low energy consumption assured by high efficiency synchronous circulating pumps. EPP insulation box (Measurements: 180x302x142 mm). thanks to its centre distance of only 90 mm. For power up to 33 kW (with Δt 15 K). 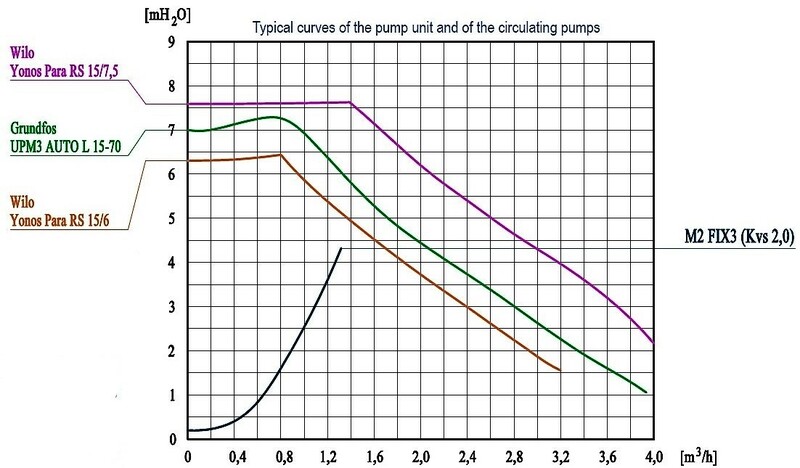 For an accurate measuring or for higher flows, please refer to the curves shown in the next page. line of the system, from 0 up to 50%. supplied with in-handle thermometer (coded blue; 0°C-120°C). During the regular working process, with the mixer completely closed on the recy cling for example, a part of the fluid is aspirated from the pump all along the by-pass line. This quantity of fluid (narrow blue arrow) represents 50% of the capacity of the mixer (red arrow). As a result, one has a very high delivery capacity and a reduced temperature. Operating range of 90°, 230V, 105 s., torque 2 Nm. IP40.